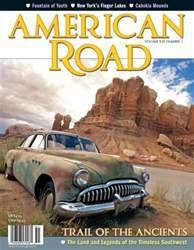 The Spring 2015 issue of American Road® magazine pays respect to the elders with a theme called "The Ancients," honoring all that endures. The journey to yesterday begins in the American Southwest. "Trail of the Ancients" traces its roots to a time when Utah pioneer Albert R. Blanding discovered the prehistoric dwelling he called "Soose Castle" and began piecing together the history of a vanished people. His work inspired a movement that created a scenic byway from the Four Corners area through Colorado and Utah and into Arizona, picking up primordial dust with every mile. The magazine looks at the road through the legends that arose from its landscape—tales of Coyote, Spider Woman, and the Twin Hero gods. "American Road's Oldies and Goodies" is the latest compendium piece, and it presents a collection of the country's oldest things. Among its twenty-one vignettes, one will meet Granddad, the Queensland lungfish who’s resided in Chicago since 1934; the creosote ring hailed as King Clone; the country's longest-burning lightbulb; and Martinka's, the nation’s oldest magic shop. Say "Abracadabra" and time stands still. After an outing that explores the stony furrows that are New York's Finger Lakes, American Road® searches out the Fountain of Youth; digs up the old birdman at Cahokia Mounds; digs into the singing sand near Fallon, Nevada; and digs down into Grand Caverns, the oldest continually operating showcave in America.